So coming up this September (or so) I will be MIA for a bit, and the shop will be closed temporarily while I’m on maternity leave! 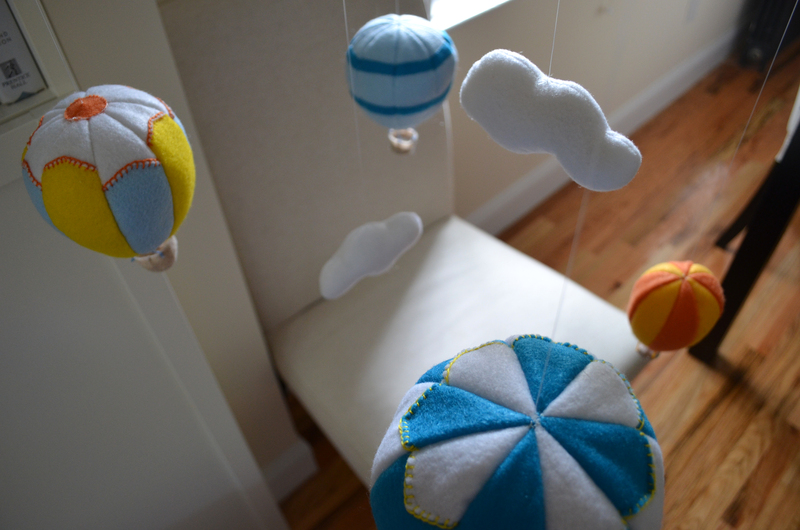 In preparation for the baby I’ve been working on a few handmade items. 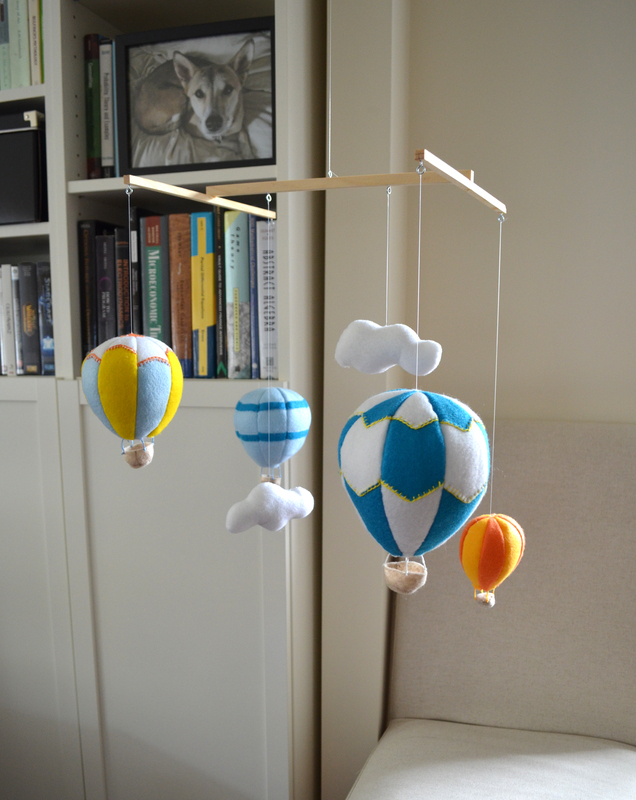 I found this fantastic tutorial, complete with patterns, on how to make a felt hot air balloon mobile. I’m not much of a sewer, but since this didn’t require a machine I thought it would be worth a try. The setting is not so great since it’s currently hanging in the living room where I assembled it, but it will be going into our bedroom and then the nursery as the baby grows. I made a few changes from the original tutorial. First, instead of a large embroidery hoop. I created a frame using sticks of craft wood from Michael’s that I nailed and glued together, and then added screw eyes to suspend the balloons/clouds since I had them leftover from the craft show card display. For the patterns on the balloons, I followed a couple of the ideas from the tutorial and tried a few of my own. 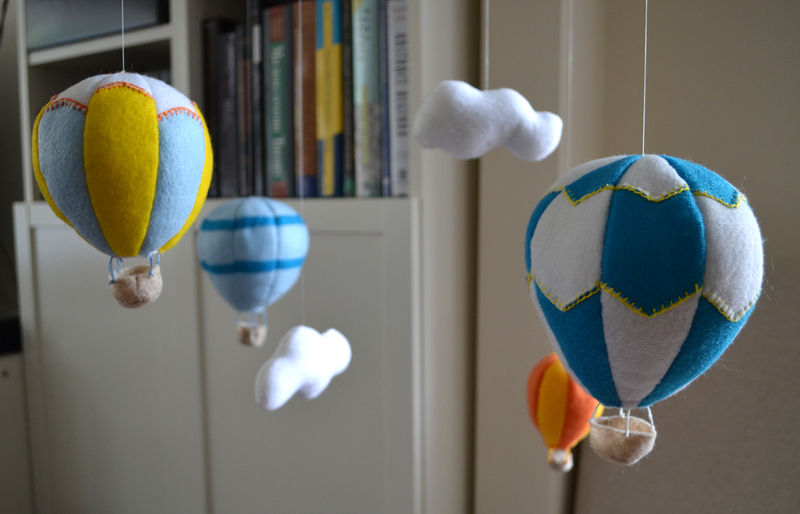 Another change I made was that instead of using cork for the balloon baskets, I made tiny little felt baskets and suspended them from the balloons with embroidery floss. I’m happy with how it turned out, and hopefully the baby will enjoy it too. My stepdaughter is due in September too – cute idea for a nursery! Any chance you could be commissioned to make another mobile? I am in love with your work! Thanks so much! Unfortunately since I only have a very basic knowledge of sewing, it took me forever to complete this one and it wouldn’t be feasible for me to repeat it. 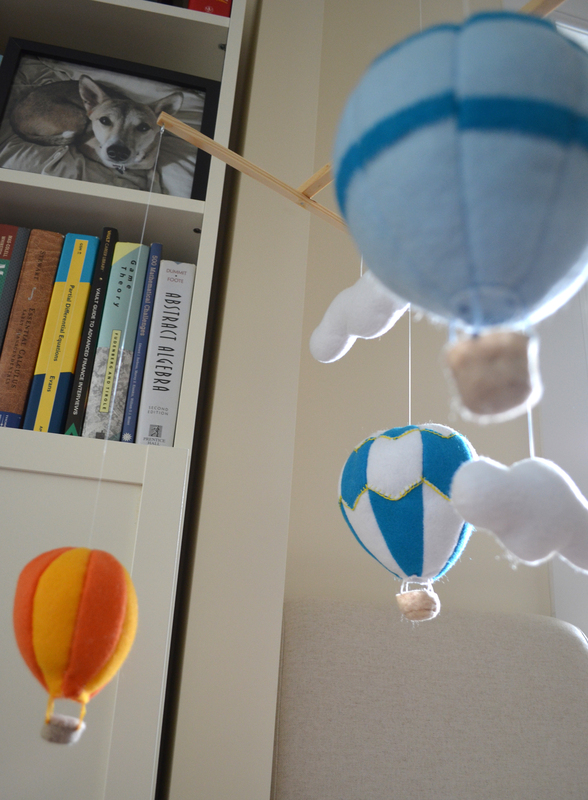 The tutorial I followed is excellent though: http://www.howjoyful.com/2012/07/nursery-felt-hot-air-ballon-mobile-tutorial-and-pattern/ If you’re not crafty you could also try finding a seamstress on Etsy and getting a quote.